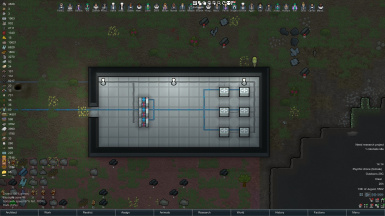 A Mod which allows centralized air cooling/heating. 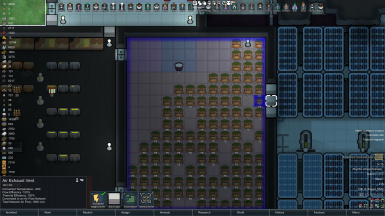 Build large Cooling Systems in your map away from your rooms/buildings. 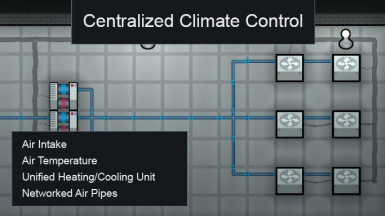 - carlgraves for "Central Heating"
A Mod which allows centralized air cooling/heating. Build large ACs in your map away from your rooms. 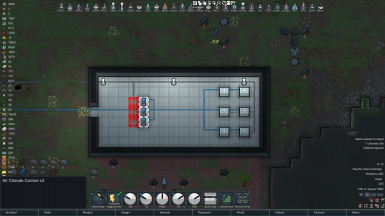 While there are many alternate mods for Central Heating. 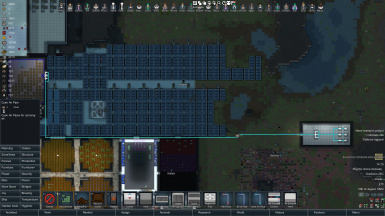 This mod adds a new network-like resource (like electricity) Air. The heating/cooling system you will build depends on the number of rooms and the heating/cooling capacity of your air networks. There are 3 colored pipes available. All can carry any type of air. Heating and Cooling is done by 1 unit, so reduces the need to build coolers and heaters. The Heat Exhaust of the Climate Control units isn't located adjacent to rooms. They are located far away from your rooms, thus allowing you to make adjacent rooms to fridge rooms. There is a network-like resource (like electricity) which is generated and consumed which is further dictated by Efficiency of the Network. The rate at which your rooms will cool/heat or maintain heat due to changes in the room temps. The rate at which your Climate Control units can heat the air. Sudden changes like Cold Snaps or Heat wave will inject very cold or very hot air into your system. Climate Control Units will take care that, but their rate is determined by this Efficiency unit. You can always check efficiency of each network at the Vents. 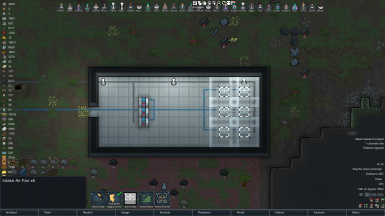 This mod also deals with the temperature of the air in the Pipe Network. Intakes take note of the Air Temperature the take in. We can practically make Climate Control-less networks that share the same temperature. 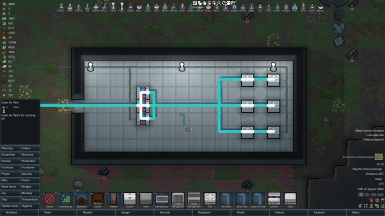 Multiple Frigdes can be connected together, but only 1 is getting the cooling. The rest just share the air. Build larger Intakes and Climate Units which have about 5x more power than a regular machine. Thanks if you are trying my mod out!